Breaking news....Arthur Villanueva of Bacolod City won the vacant Oriental and Pacific Boxing Federation (OPBF) super flyweight title against Taiki Eto of Japan by unanimous decision in a fight held in Tokyo. ALA Promotions informed philboxing that the fight was very close and Villanueva was knocked down twice but was able to recover and score enough points to win. The scores were 113-112, 114-112 and 113-112. This is the first regional title for the unbeaten Villanueva, who improves to 21W-0L, 12 KO's. He is a former Philippine flyweight champion. He won the Philippine title in 2010 by 7th round TKO over Brix Ray. He campaigned at the superflyweight division last year and beat another top prospect Mark Anthony Geraldo by six round technical decision in the undercard of the Donnie Nietes-Armando Vasquez fight in Bacolod. Villanueva started his pro career with the Top Prime Stable of Rev. Henry Guanzon in Bacolod using the moniker "El Matador" before signing to fight under ALA Promotions last year and was billed as "King" Arthur in his recent fight. 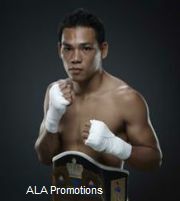 Last September, he beat the experienced Thai Pramunsak Posuwan by unanimous decision at the Waterfront Hotel. Eto drops to his second loss with 10 wins, 7 KO's. The fight was held tonight at the Korakuen Hall.